Looking to create or expand an online personal learning network? This illustrated guide can help. Today, more and more school leaders and educators are creating Twitter accounts in order to access the overwhelming amount of free professional development that Twitter has to offer. For this article, we are going to focus on using Twitter chats to interact with your professional learning network (PLN) and to take advantage of all that free PD. According to teacher and blogger Kathleen Morris, Twitter is an excellent way to access thousands of individuals “around the world with rich backgrounds and experiences that can contribute to your professional growth.” A PLN on Twitter is made up of the individuals that you choose to follow and the individuals who choose to follow you on. In the simplest terms, this is your PLN. If you only follow 10 individuals on Twitter, you will only see the tweets of those 10 individuals. If only 10 individuals follow you on Twitter, only these 10 individuals will see your tweets. Please note: You must have at least 10 followers on Twitter before you can take part in Twitter chats. This is a way that Twitter protects against spam. A great way to start building your PLN is to search for hashtags of Twitter chats that might be of interest to you. You can do this by searching in the Twitter search box. An example search for an assistant principal might be #apchat (an assistant principals’ chat), whereas an example search for an educator might be #edchat (a chat on all education subjects). Other examples of searches could include #scichat (a science teachers’ chat) and #artsed (an art teachers’ chat). Searching for these hashtags and others allows you to find individuals on Twitter who are interested in the Twitter chats that you are interested in. You can find a detailed list of Twitter chat hashtags listed by time zone and day of the week here. Once you build your PLN, you can start participating in professional development via Twitter chats. Most times, a Twitter chat consists of one moderator (generally an expert in the field) asking questions while participants answer the questions and also communicate with others involved in the chat. Other times, a group debate may take place in which everyone may share their opinion regarding the particular topic. In both cases, you are interacting with your PLN. An important component of participating in Twitter chats is knowing when they are regularly held. You will want to note the scheduled days and times of chats you are interested in. (You can refer to the link provided earlier in the article to get you started). There are many benefits to participating in Twitter chats. Stephanie Leishman, a social media strategist at Massachusetts Institute of Technology, lists the four benefits of joining a Twitter chat as “Learning, Networking, Visibility, and Reputation.” We would argue that learning and networking are the two largest benefits. So, you’re new to this educational Twitter world and don’t know where to start or how to participate in a Twitter Chat. No problem! 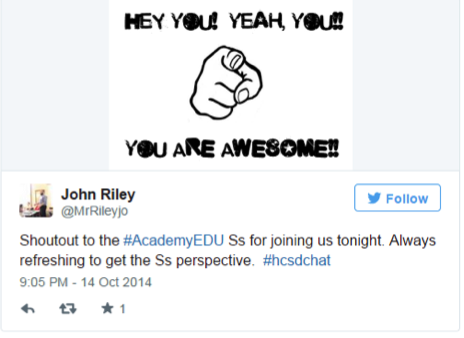 Take a moment to check out the screenshots below from #HCSDchat, a chat focused on homework. You’ll notice that the moderator and participants in the chat are using the Q1:A1 format, where Q1 is question 1 and A1 is answer 1 to question 1, and so forth. Most Twitter chats follow this general format. The screenshot below shows an introductory tweet by a moderator. These introductory tweets usually include pertinent information regarding the upcoming chat including the topic and the question/answer format. In the next screenshot, the moderator is interacting with a student audience. (Note that Ss = students and Ts = teachers). All tweets will use the #hcsdchat at the end. This will ensure that your tweet shows up in the chat feed on Twitter throughout the conversation. The next screenshot shows an initial question posted by a moderator. Notice that Q1 stands for Question 1, and again, the hashtag #hcsdchat keeps all the tweets connected throughout the chat on Twitter. 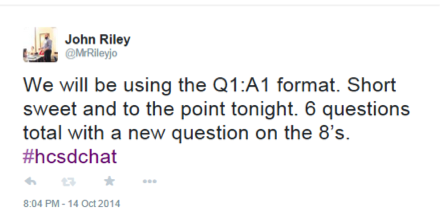 Below is a sample response to a moderator’s question using the Q1:A1 format. The “1” beside the star means that someone in the chat “favorited” this response. Most chats will end with the moderator bringing the chat full circle with some sort of a closure to the chat. In the example below, the moderator includes a Pledge to make change and implement what you have learned during this particular chat. During a chat, it can be hard to keep up with the conversation. With so many people responding to the moderator it is easy to get lost. Don’t worry. The more you chat, the better you will become at keeping up with all of the responses. That being said, this is where a Storify of the chat comes in handy. Typically, the moderator will curate a summary of the chat using Storify, which, according to Liz Dexter, “is a social media tool that lets you create stories or timelines from a variety of social media resources like Facebook and Twitter, as well as other web resources. You can use it to pull together information on whatever you want, and can customize it how you want, then share your story on the site with your friends on those social media sites.” Here’s an example of a Storify from the homework chat sampled previously in this article. When it comes to professional development, it’s important to follow individuals who share innovative ideas about education and who are passionate about what you are passionate about. For example, you might follow Jon Gordon, Author of The Carpenter, because he shares a great positive outlook on life and love for servant leadership. You could take what he posts and put it to practice in your professional life. Twitter chats are a vital part of professional growth. This is where personalizing professional development through social media comes into focus. Here, individuals can share ideas, links to resources or inspirational quotes. Chats can also be the starting point for collaboration sessions with other educators. The opportunities to connect and learn from other educators around the globe become endless. When all else fails and you’re not sure what you’re doing, watch this YouTube clip for some Twitter etiquette and a good laugh.